Company data feature enables company account owner and company administrators who are granted with such rights to review all the actions that were performed by the company users with all company users documents. Company account owner and company administrators can also review company documents by selecting individual company users. 1. Log in to the portal and click the "Company data" button, located at the very top of the page. 2. You will then see all actions performed by your company users. 3. You can use a search bar. Type your company user name or last name or the title of the document. 4. If you click on the document title (the link), the document will be opened in a separate window. 5. To filter documents by performed actions, click the "Show all" button on the right side and choose the action. 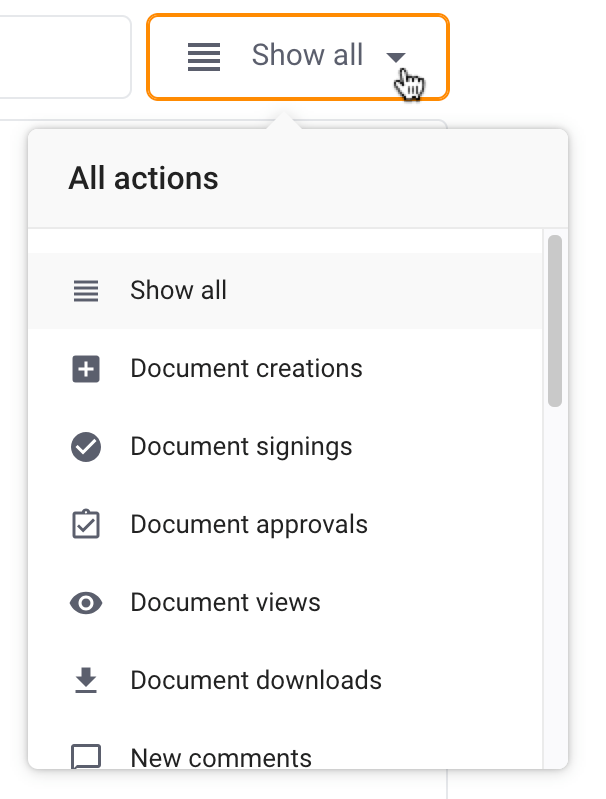 Document creations - who and when initiated document signing. Document signings - who, when and with what eID signed which document. Document approvals - who and when approved which document. Document views - who and when reviewed which document. Document downloads - who when downloaded signed documents to their computer. New comments - who and when left a comment to which document. Document participant removals - who lost the access to the document and who and when removed it. Document participant additions - who gained the access to the document (who was invited to sign or review the document and who gave this access. Deadline changes - who and when changed the signing deadline to which document. Role changes - whose role was changed, e.g., from signer to viewer and vice versa and who and when changed this role. Document renames - who, when and how the title of the document was changed. Document validity extensions - shows documents that are prepared for long-term storage. Ownership transfers - who and when transferred their document ownership to another user. Billing/plan changes - who and when changed billing details or any other billing/plan related changes. Company user changes - who and when performed any actions related to user creation, suspension, deletion, administrator rights promotion etc. Document metadata changes - who and when changed any metadata (signing document number and signing client code) to which document. This metadata is only visible and available to those companies which have a branded user experience. 6. To remove the filter, choose the "Show all" option or click the "Audit trail" tab to refresh the page. 7. Log in to the portal and click the "Company data" button, located at the very top of the page. 8. Click the "User's documents" tab and click "Select user". 9. Select user from the list by clicking the "Select" button next to their name or use the search bar to find the person. 10. You will now see user's document listing page. You can open any document and you will have the same document editing rights as the user. 11. You will see who's documents you are accessing at the top of the page. To change the user, click the "Change" button and select another user. How to manage my company users?